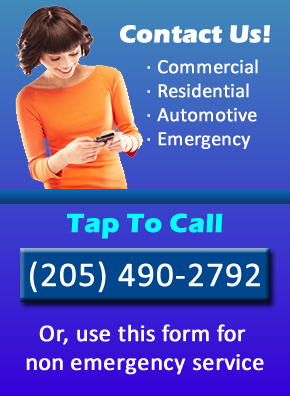 (205) 490-2792Fast, Affordable Locksmith In The Birmingham Area! We are your local Birmingham AL locksmith providing a varaiety of locksmith services in the Birmingham, AL Area. If you are in need of a locksmith, give Bham Locksmith a call today. Most of the calls we get come from people who lock their keys in their house, car or business. We know that this is a terrible thing to happen and can make you feel pretty bad. Well, cheer up. It happens to the best of us. Lucky for you you have found an affordable locksmith in Birmingham Alabama. We’ve been serving the Birmingham community for over three years and have built a reputation upon being a fast affordable locksmith in the area. There are a lot of locksmiths in Birmingham but there’s only one as good as Bham locksmith. We treat your customers like family and do our best to make sure your experience is a pleasant one. Everybody needs to get somewhere quickly. We understand that. If you lock your keys in your car, house or apartment you want some in their quickly to get you back in. We’ve had clients who lock their keys in the car while the engine is running and with gas is expensive as it is, that can burn a lot of money fast. Other people we know them late for work, meetings, you name it. Our priority is getting to you quickly and providing expert locksmith services. We put ourselves into the shoes of our customers and try to understand the situation that you’re in. We can relate and we will do our best to get to you very fast. Our typical response time is 15 min. in the Birmingham Metro area. Outlying areas may take a little longer but you never know, we might have someone in your neighborhood right now. We recently invested in a high-tech GPS dispatch system allowing us to locate our nearest technician to your location. We did this to increase efficiency with our dispatch team. We can now enter your current location into her computer and see which locksmiths we have nearby to your location. We can also tell which of our technicians are available and which are working on jobs that may take a while. We are the only locksmith in the Birmingham Alabama area with this technology. If you want to go with the latest and greatest most efficient locksmith in Birmingham call Bham Locksmiths today.